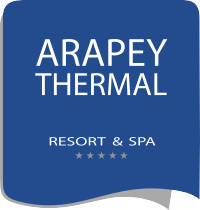 In December 2017 Arapey Thermal Resort & Spa incorporates a Healthy Theme Park to its integral recreational proposal. This space, located in an environment of privileged views of the Arapey River, contemplates endless endowments and activities designed for the healthy enjoyment of the whole family. The large green space in which it is located, offers a diversity of healthy facilities for children, adolescents, youth, adults and seniors. The park is equipped, among others, with Caballeriza; Mono Bridge; Giant labyrinth; Elastic beds; Childish games; Military Training Camp; Pedestrian Circuit; Healthy Gymnastics Teams; Bocce Court; Cancha de Tejo; Viewpoint to the Arapey River; Pub; Corner for stoves and for traditional indigenous meals.